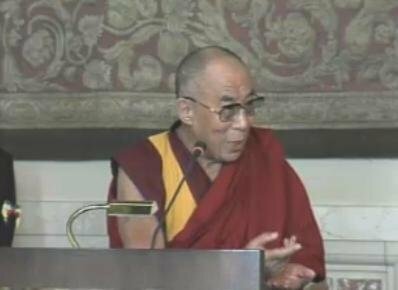 The responses were released on the Chinese-language website of the Office of His Holiness the Dalai Lama on 19 July 2010. Question One: Looking at the current situation, it seems difficult that a reconciliation with the Chinese government will come about in your lifetime. After your passing away, you will have no control over the Tibetan youth organisation which holds on firmly to their ideology [of seeking Tibetan independence]. Is it not possible that they will engage in large-scale terrorist activities then? Are there ways by which they can be prevented from taking such a course? taking up greater leadership roles in the spiritual field. In the political field, for the last more than 10 years I have been in a state of semi-retirement. All the important political decisions are being taken by the elected political leadership and this will continue to do so in the future as well. There are forces within our community such as the Tibetan Youth Congress who criticise our Middle-Way policy and demand complete independence [for Tibet]. It seems their voices are growing stronger [these days]. We cannot blame them for this, since our successive efforts to bring about a mutually-beneficial solution [to the issue of Tibet] have failed to produce any positive results and under such a situation, their viewpoint is gaining momentum [in our society]. However, it is very evident that 99% of the Tibetan people have complete faith in the non-violent path [that we have chosen] and so you should not worry [about their ever resorting to violence]. Question Two: Your Holiness, how do you plan to resolve the problem of those areas which form a part of your notion of 'Greater Tibet' but are incorporated into the Chinese provinces as far as the current administrative divisions of these provinces are concerned? Will the autonomous government of your 'Greater Tibet' exercise control over the other ethnic groups living within those areas? If so, how would you safeguard the aspirations of these ethnic groups? Answer: We have not used the term 'Greater Tibet'. It is [actually] a term employed by the United Front Work Department of the Chinese government [to refer to our demand]. What we say is that all those Tibetans who speak and write the same language of Tibet should have equal right to preserve and promote their religion and culture as well as to work for their collective economic development. Now this is, in principle, agreed upon by the Chinese government. In the Fifth Work Forum on Tibet, the Chinese central government has recommended a uniform policy for overseeing all Tibetans living in the Tibet Autonomous Region and in other Tibetan autonomous areas under the four Chinese provinces. Premier Wen Jiabao has, particularly, mentioned this in his work report to the National People's Congress. This, I believe, is really in keeping with the actual prevailing situation. Otherwise, when the word "Xizang" is mentioned, it is taken to be as referring only to the Tibet Autonomous Region. This is not right. There are only a little over two million Tibetans living in the Tibet Autonomous Region and the remaining approximately four million Tibetans live in the neighbouring four Chinese provinces. As such, we are saying that all of these Tibetan people should be given the same rights. For example, I do not belong to the Tibet Autonomous Region; I hail from Tso-ngon [Ch: Qinghai] province. Likewise should you care to look at Tibetan history, you will see that many of the highly-realised Lamas/Tulkus have come from these four provinces. Even today, most of the [respected] teachers teaching in the monastic institutions of all the religious traditions of our community have come from these provinces; very few of them belong to the Tibet Autonomous Region. Therefore, we are saying that a uniform policy should be adopted for all of these areas since they share the same religion and culture. It is altogether a different matter if we are seeking separation or independence but we are not. We are simply saying that we be granted the freedom to preserve our own religion, culture and language within the larger framework of the People's Republic of China. If, in due course of time, we get an opportunity to discuss about it in detail, then the Tibetans inside Tibet should take the main responsibility. Once they are able to engage in extensive discussions [with the Chinese government] without any fear in their minds, I do not think we will face any problems [in resolving the issue of Tibet]. In the case of the Tibet Autonomous Region, a few Chinese lived there prior to the 1950s. [The number grew later.] A considerable number of Chinese, however, have been living in Kham and Amdo regions, particularly in the area of my birth [Xining], since early times. Tibetans are not saying, and will never say, that Tibet should be occupied by exclusively Tibetans to the exclusion of all other nationalities, which includes [even] the Han Chinese. What is important is that since it carries the name 'Tibetan Autonomous Region' or 'Tibetan Autonomous Areas', the natives of these very places should constitute the majority -and the rest of the nationalities the minority of the total population. It is for this very purpose that the name has been given. If, otherwise, the number of Chinese or other minority nationalities living in these places is more than the Tibetans, then there is no way such names as mentioned above could be given. We are hoping that we are able to establish a big family of friendship between the Chinese and Tibetan peoples based on over thousand years of relations with each other. We also hope –and even pray that the People's Republic of China flourishes with all its nationalities enjoying equality in a spirit of one big family. Question Three: Last year, a television channel in France broadcast a documentary titled The Dalai Lama's Demons, in which Shugden-worshipping Tibetan monks were shown to be thrown out of the Tibetan settlements in India. The situation has come to such a pass for these monks that they could not even visit shops and hospitals as well as enter their monasteries at the time. In the documentary, you were also shown to be issuing a strict order that these Shugden-propitiating monks must be expelled from their monasteries. Moreover, one of the monks interviewed said: 'On the one hand the Dalai Lama talks about the freedom of religious belief and compassion, but on the other hand he restricts our religious freedom and shows us out of our monasteries.' What do you have to say about it? Answer: Gyalpo Shugden came into existence during the time of the Great Fifth Dalai Lama. The Fifth Dalai Lama saw Dorjee Shugden as 'a vow-breaking demon/evil spirit born into such a state as a result of his wrong aspiration/negative prayer". This is mentioned in the Collected Works of the Great Fifth, Volume K,- an earlier edition block-printed in Tibet. So 'wrong aspiration/negative prayer' is what caused Dorjee Shugden whose nature is but a 'vow-breaking demon/evil spirit' and whose actions are to 'harm the Dharma and humanity'. This is admitted by the Dolgyal himself in his autobiography. Earlier I too propitiated Shugden. Later on as I studied the words of the Great Fifth, I came across the document cited above. I have, from my side also, conducted a series of investigations about it and found that it is not good to worship the spirit. Consequently I gave up the propitiation completely but did not, at that point of time, place any restrictions on the section of the Tibetan community who were practising it. Then the problem surfaced at the Jangtse College of the Gaden Monastery. Through my examinations, it became very clear to me that the problem at the Jangtse College was caused by its new initiative of propitiating Gyalpo Shugden. I communicated this to the concerned. When the issue became more public later on, some people began to spread the rumour that I was trying to curry favour with the Nyingma Tradition [of Tibetan Buddhism] and that I had not actually imposed any restrictions but simply pretended to do so. Under these circumstances, I had to come out in the open to express my strong objections to, and make things clear about, the worshipping of this evil spirit. No children of the Dolgyal followers have been expelled from the schools. If in the monasteries the worshippers and non-worshippers of Dolgyal assemble together, it does not go very well with the sanctity of the spiritual bond [that is so very essential in matters of spirituality]. Those who do not worship Dolgyal have all received spiritual teachings from me and those who worship it are the ones who have some problem or disagreement with the Lama from whom they receive teachings. Therefore we are saying that we feel very uncomfortable to be associated with the Dolgyal followers. Apart from that, we have done nothing to throw them out of the Tibetan settlements. I urge all of you to come to India and visit the Tibetan settlements in South India to see for yourselves what the reality is. The Dolgyal followers have established their own separate monastery there and lead their lives like any other Tibetan. Nobody is creating problems for them. In short, what I am saying is that it is one's freedom, in general, to practise or not to practise any religion. How one chooses to practice one's religion is also one's freedom. Therefore, whichever deity or demon one may worship, one may decide as one pleases. To say that the practice of the spirit in question is disadvantageous and it has no advantages whatsoever is my duty. Therefore, I have highlighted the negatives. Now it is up to the people to think over or decide for themselves whether they want to listen or not. A Chinese friend has raised this question. If you are interested in the subject, it is [really] your freedom [to worship or not to worship the spirit]. But you must carry out a proper investigation [before plunging into it]. Usually, our religious practitioners say that 'one must develop a pure perception of one's teacher and investigate [thoroughly] the religion one practises'. So religion must be subjected to investigation. For instance, Nagarjuna and other scholars [of the ancient Nalanda University] have shown through their example that even if they were the words of the Lord Buddha, they must be subjected to investigation for ascertaining their truthfulness. [The Buddhist concept of 'Four Reliances' says, among other things, that] one must 'rely on the doctrine than on individuals'. So it is very important for all of you to investigate. Question Four: During the 2008 Tibet incident, why did many monks and lay Tibetans raise their hands against the ordinary Chinese citizens? We must understand that it is the Chinese government which you are against [and not the ordinary Chinese citizens]. Answer: As far as I know, the first protest of 2008 in Tibet occurred in the afternoon of 10 March. This was then followed by more protest demonstrations on 11, 12 and 13 March of that year. The Chinese security people, from the very beginning, learned about these demonstrations as a result of which they blocked the road of the monk protestors arriving from Drepung Monastery. On the morning of 14 March, the incident of setting shops on fire, hurling stones and destroying properties occurred. One foreign journalist, who had been an eye-witness to this incident, came to meet me [at Dharamsala] and told me: 'Apart from video-taping the entire happening, the Chinese security personnel at the scene did nothing to stop them.' The Chinese government's propaganda about the 3-14 incident disregards the fact that the first protest broke out on 10 March. Moreover, according to reports they deliberately hired some mischievous people on the morning of 14 March to indulge in rioting, which they video-shot for later use in shifting the blame of the entire incident on the Tibetans. Tibetans arriving from Tibet after the March incident informed us that 'Tibetans' whom they had never seen earlier had been brought to Lhasa at that time. They further said that 'these people were the main culprits who created the disturbances'. [I believe] this [unfortunate] incident should actually be investigated independently. This is one thing I want to say. then I stand ready to apologise [on their behalf]. It is very likely indeed that some enraged Tibetans may have caused such a situation because at that time, the Chinese government tried [its level best] to create the false impression of the Tibetans as being anti-Chinese. Majority of the Tibetans would never do such a thing. Tibetans cannot be blamed for airing their grievances against the Chinese government policies. The Chinese government strikes hard upon the Tibetan people for the [only] reason that they are loyal to their religion and culture as well as their spiritual leader. This creates a feeling of hurt in the minds of the Tibetan people. This is also the reason why Tibetans are strongly critical of the Chinese government policies. You should not, however, take this as a form of Tibetan people's animosity to the Chinese people. If what I have heard is indeed true, then Tibetans visiting the Chinese cities and towns seem to be facing a lot of problems after the 2008 March incident. This is because the Chinese hoteliers, shopkeepers and restaurateurs in these places show a cold attitude to the Tibetan customers. Moreover, we have heard that a lone Tibetan member of a Chinese government delegation was stopped at the airport for interrogation. All these developments are a cause of disappointment for the Tibetan people. Question Five: Was the 'liberation of Tibet' a deception from the beginning or did it change later? Answer: It is difficult to say. When the People's Liberation Army arrived in Chamdo, they fought with the Tibetan army and killed about seven to eight thousand Tibetan soldiers. Khenchung Thupten Dhonyoe, who was a staff of the Governor General of Eastern Tibet at that time, told me that Wang Qiming, the PLA general (who 'liberated' Chamdo) said to him with tears in his eyes: 'We, fraternal nationalities, have killed each other.' I feel that some of them may have been genuine. Likewise, when the road from Kham to Central Tibet and Amdo to Central Tibet were being built, some people used their bodies to block water when floods took place. They worked hard. Those things, I feel, were genuine. For others I cannot say what their intentions were from the beginning. The best thing would be for historians to thoroughly study classified government documents, which will make things clear. That is the most important thing. In terms of overall policies, in 1954, I went to China and spent about five to six months in Beijing. At that time I met most of the Chinese leaders, including Mao Zedong, who I had met many times. I especially went to visit many Chinese provinces, during which I met many Chinese leaders, who were members of the Communist Party and had real revolutionary outlook and were genuinely working to serve the working class and the country. I saw many who had no desire for personal gain and were working for the common good. They impressed me. Mao, for instance, made many promises to me. However, from 1956-57 onwards, I felt that things were moving towards ultra-leftism. Question Six: If in the future China will have a genuine democratic system, what would Tibet's relations be with that government? What is your opinion? Answer: Right now many of the unwanted problems, whether it is PRC's external relations or issues within the country, I think, are created by suspicion and lack of mutual trust. For the last 51 years, I have lived outside Tibet. From my many friends in the US, Europe, Japan and in India, I know that China has the desire to build good relations. But its failure to build genuine relationships is due to the lack of mutual trust. This, in turn, is the result of lack of transparency in China which, though, it outwardly pretends to have so. Hence many problems arise. Whether it is the issue of Tibet or Xinjiang, there is clearly a huge difference between the external impression that China gives and the real feelings that the people in these regions harbour. Therefore, once a time comes when China will have transparent, honest and just policies, many of the problems will naturally be solved. Regarding the Tibetan issue, if there is transparency and sincerity on the part of the Chinese government, we on our part are not seeking separation. We have a long history, but I am not thinking about it. If we think about the future, materially Tibet is behind others and therefore if we stay within the PRC, it will be beneficial for Tibet's development. Because of this we are not seeking separation. The most important thing is that Tibet has a unique culture, language and religion. Amongst the Buddhist traditions, many of the world's scholars today say that Tibetan Buddhism is the most extensive and profound. Tibetan language has become the best medium to articulate/express this profound and extensive philosophy. The translations - both in terms of literal translation (dra gyur) and contextual translation (don gyur) - of the texts from the Sanskrit language are of the highest standard. Therefore, if we are able to maintain this religion and culture, it will also benefit the overall culture of the PRC. Generally speaking, China is also a Buddhist country. As the number of Chinese Buddhists is increasing these days, we will surely be able to contribute in this field. I think this is of mutual benefit. Question Seven: If Tibet achieves genuine autonomy or wins independence, do you have plans to transform the system of governance in Tibet into a democratic one? How will religion and politics be separated? Answer: I do not think this question needs a special answer. If you are interested, you can come to India. You will then actually see how we have carried out democratisation during our stay in exile, how we have set up a political system during the last 51 years and our future programmes. For me personally, since 1969, I have been saying that the people should decide whether the institution of the Dalai Lama should continue or not. I have no worry. The most important thing is that we need to preserve and maintain the unique Tibetan religion and culture. In terms of Tibet's development, it is very important not to harm the natural environment. Tibet's environment is fragile and susceptible to damage. Because of the high altitude and dry wind, it is said that once damage occurs, it will take a long period to restore the ecological balance. This is a special issue that you must pay attention to. The glaciers in the high Tibetan Plateau are the main source of many of the great rivers in Asia. That is why we should take special care of them. Question Eight: What do you think will happen to Tibetan unity once you are no longer in the scene? Will the charisma of your successors be able to control the Tibetan nationalists to retain the non-violent and peaceful nature of your struggle? Answer: It will make no difference. For over 30 years I have been saying that Tibetan religious and political leaders must take responsibility as if I am no longer with them. They have been doing it and that is how they acquire experience. There is a new leadership after every five years. There will be a new political leader next year directly elected by the people. In the religious field, there are heads of each Buddhist school to take responsibility. There is no difference whether I am with them or not. Question Nine: You say that there should be a democratic system for Tibet. However, when you and your predecessors ruled Tibet did you rule democratically? If not, what confidence do you have to rule Tibet more democratically than Communist China? Answer: The First to the Fourth Dalai Lamas did not take part in politics. The Fifth Dalai Lama became the temporal and religious leader of Tibet. At that time there were no such thing as democratic system in Tibet's neighbours like China, India and Russia. They were all largely feudal societies. However Tibet had a strong Buddhist tradition and the principle of developing compassion for all sentient beings. That is why, in 1959, when the 'landlords' were put under struggle sessions following the 'Democratic Reforms', there were many 'serfs' who came forward to save the lives of their 'landlords'. Many of the 'landlords' were also able to escape into exile in India with the help of their 'serfs'. Therefore, 'serfs' may be a common phenomenon in all these feudal countries, but the treatment of Tibetan 'serfs' was different. At the end of 1955, 'Democratic Reforms' were carried out in Tibet starting from Sichuan. As elsewhere in China, 'Democratic Reforms' were carried out in Tibet, which did not suit the Tibetan situation. Such things happened. It is important to investigate these things. You do not have to believe these things because I said them. If you have the freedom later to investigate it is important to do so thoroughly. In the later stages of his life, the Thirteenth Dalai Lama thought about introducing a democratic system in Tibet, but he was unable to carry it out. In 1952, when I was in Lhasa we formed the Reform Committee to make a number of changes to our taxation and loan systems. But we were only able to carry out some of them. Since I already had thoughts about carrying out reforms from the time I was in Tibet, we established a democratic system immediately after we came into exile in India. I have no intention of holding any post when Tibetans in and outside are reunited. I made this clear in 1992 that when there will be autonomy or a considerable degree of freedom for Tibet, we will return. However, I said, from that time onwards I will not take any responsibility and will hand over all my historical responsibility to the local government. Even now that is my thinking and I will never take any political roles. Question Ten: What is your view on the Chinese who are settled in Tibet and the second-generation of Chinese living there? It is possible that your 'High Level of Autonomy' may end up marginalizing them, which is the concern of those Chinese inside Tibet who are opposing you and the Tibetan administration in exile. Answer: Tibet is an autonomous region. In that region Tibetans cannot become a minority. Otherwise, we will applaud however many Chinese brothers and sisters decide to stay there. Particularly, we will appreciate those Chinese brothers and sisters who are interested in Tibetan religion and culture. I normally say that Chinese brothers and sisters can cook us delicious food and we Tibetans can provide spiritual food to them through Buddhism. That is why there is absolutely no reason to worry. Then there are those Chinese who look down upon Tibetans by considering Tibetan Buddhism as bad and the Tibetans as dirty. For them, there is no reason to live in such a filthy place; it is better for them to return to cleaner places. Tibet predominantly practices Buddhism and in Buddhism there is totally no reference to racial discrimination. Earlier in Tibet, many of the abbots in monasteries were Mongolians and there were Chinese studying Buddhist scriptures as well. We were of different races but there was no discrimination whatsoever. Likewise, if there are religious scholars amongst Chinese, they too can become abbots and Lamas in Tibet. There is no difference at all.